I absolutely love this show, I watched season 1,2, all the OVAs and the Movie in 2 days, I cannot get enough of it! I'm giving this season 4 stars for one reason, which doesn't bother me that much but annoys others, which is the fact that Rikka and Yuta's relationship doesn't really develop more than holding hands a bit more and (if my memory server correct) a kiss or two at the end. This show is amazing, I love the characters and I love the style, the fact that it's based around something people can relate to, but to some degree blown out of proportion to make the show more interesting is amazing! I was expecting to write a review about how this season wasn't as good as the first one, and it seemed pointless, but that was only after watching the first episode. The first episode was what I was expecting when I found out there was a second season, but it got so much better after that. While I didn't feel the need to binge in in two days like the first season I still finished this season pretty quickly. Maybe there wasn't a main plot in this season, but I found that was hardly an issue as it was still really entertaining. The only thing I wish was that they still showed the switch from the battles in the girls' minds to what their battles actually looked like in real life, that was awesome haha. This anime has to be one of my most favorites. After watching both season 1 and 2, the characters, the story, the emotions, the art style, the scenery, it was all just fantastic!!! Brought new characters and a new mission to the table, and brought back the fun that season 1 lost in its latter half. It was nice to see how each character has evolved from their experiences from the first season, particularly Rikka. In addition, the introduction of Shichimiya brought new themes and obstacles to overcome, preventing the show from becoming stale. Unfortunately it doesn't quite match season 1. To me the stakes are too low in comparison. The previous season hooked with its balance between light-hearted humour and serious emotional themes. This season was sadly not up to par, it was too unbalanced toward humour, and lacked the emotional depth that I'd come to love about it. Lackluster followup that leads to no resolution. 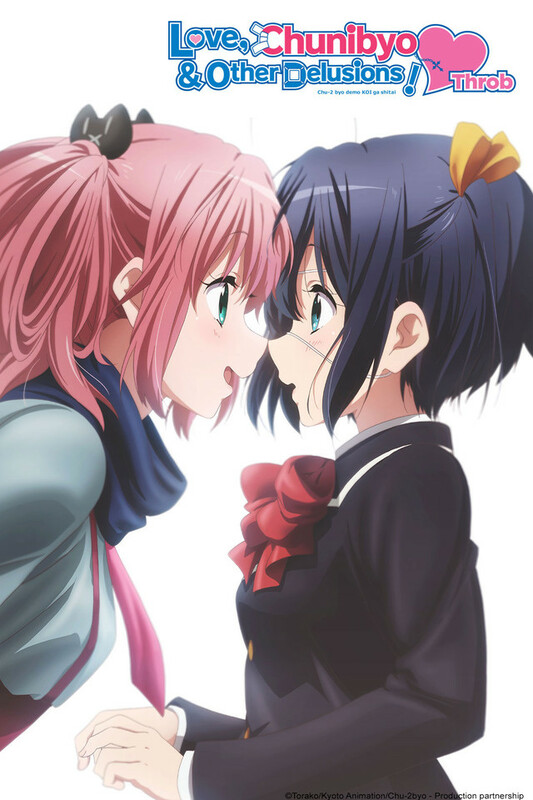 The fact that in two seasons Yuta and Rikka never kiss, is absolutely ridiculous. They kiss in the LN and the pointless buildup in the show never actually ends up leading anywhere, it could have made for a very impactful scene and instead the studio chose to tease the idea for 24 episodes and never actually get the job done. Terrible decision that rendered the second season pointless and genuinely detracted from the overall quality of the show. This season was a bit of a lesser son of greater sires experience. I hate it when an episode is devoted to a love triangle, so going through an entire season where that was the main focus was really irritating. There were some great fights and the animation went up a notch from the last season, but it just lacked the heart of the first one. You would not be missing anything by skipping this. Give it a miss. Sequel why do you do this? This is the second season of Love, Chunibyo and Other Delusions! It's pretty good, the first season was awesome! It just don't have the same charm the first season had. You start to get more of the harem aspect, something you didn't have in the original, and it starts to lose its charm. It's still cute and I would watch it if you watched the first season, it just didn't have what the first season did. The complaints I found when scouring the net to find out if we will get a season three is the lack of progress between the two protagonists. Personally I think if you enjoyed the easy going fun and hilarious moments of season one you will enjoy season two just as much! Enjoy! In "Love, Chunibyo & Other Delusions - Heart Throb -" the story continues from season one. Introducing new characters, new situations, and exploring more complex ideas of a growing relationship. There are a few more expected/cliche' moments this go around, but they still manage to show growth or depth to the characters. Two awkward high-schoolers explore friendship and romance from two very different perspectives. All while their friends help and meddle. Yuta must face his past when an old friend moves in to town while Rikka must face change as her feelings deepen. There are plenty of awkward moments to go around, and the characters handle them in their usual crazy manner, culminating in a moment of mature clarity. The formula from Season 1 hasn't changed, but it still does an amazing job telling the story and showing the depth/feelings of all the characters. If you enjoyed the first series, you'll definitely enjoy this one.